Scandium, atomic no. : 21, symbol as Sc, weight at 44.96, is mainly used in ceramics, lasers, phosphors and crystal. Scandium oxide is suitable for the high index component of UV, AR and bandpass coatings due to its high index value, transparency, and layer hardness make High damage thresholds have been reported for combinations with silicon dioxide or magnesium fluoride for use in AR. 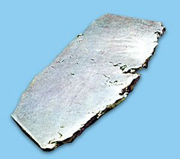 Scandium are widely used in making Scandium-Aluminium alloy.